MyFolio is a brand new social network in public beta that takes another crack at building an online community service for artists and creatives looking to share their art and converse about it with like-minded people. The startup quietly launched the website a month ago and is entirely bootstrapped by its founder Mustafa Lazkani. 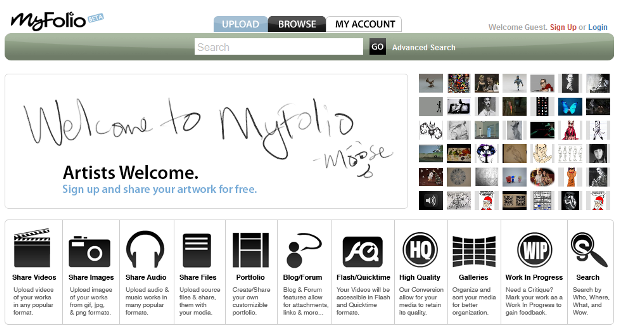 In terms of features, MyFolio covers every basic need for a social network to be useful for its creative audience. Artists can upload and tag media or files for a variety of categories ranging from animation, concept art, films, paintings to music and photography, create a portfolio, manage bookmarks and keep on top of internal messages from other users. Registered users can indicate of their work can be viewed in public or kept private, if it is work in progress or not, and which copyright applies to the work. Public portfolios (here’s mine) look rather spartan even if they can be personalized with custom colors, header and text, so I suggest MyFolio to do something about if they want to make artists want to show off their work by spreading links to those pages. MyFolio is free up to 1 GB of storage, which I imagine will quickly prove insufficient for many artists, but offers a paid version at $2/month which removes ads from the portfolios and comes with 2 GB of storage (more isn’t possible at the moment). I’m generally skeptical when it comes to niche social networks. I think the large majority of new community sites have too much of an uphill battle to fight against established social platforms – particularly when you need to create yet another account for your profile – and I also believe that if there isn’t a proven social network for a certain niche by now, there probably never will be. And if there is already one, it’s going to prove very difficult for a new entrant to get a piece of the action. That said, MyFolio looks and feels nice and offers all the whistles and bells that are to be expected for this type of service, so who knows if it will hit the sweet spot with its target audience. MyFolio will have to compete with other art-related social networks like deviantART, Carbonmade and FoundMyself but also with traditional photo sharing services like Flickr, which can also easily be used for social networking within an artist community.